Signed Neil Gaiman and Chris Riddell book in now! We have a few signed copies of their gorgeous new book Art Matters. Neil Gaiman/Chris Riddell signed copies now in store! We also have the small book How the Marquis Got His Coat Back, also set in the Neverwhere universe, if you need a little extra fix too. 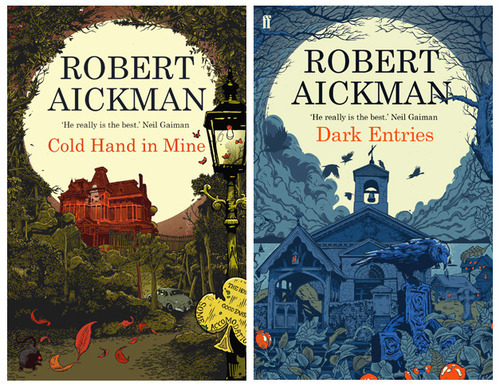 Robert Aickman is another contender for the best writer you’ve never heard of, so his centenary (on 27 June) is a perfect moment to sample his ‘strange stories’. Tartarus Press has done valiant work in keeping Aickman in print by publishing handsome hardback editions, and now Faber & Faber is reissuing several paperback collections this summer and a couple of rare novels. His debut collection, Dark Entries, is available now and includes an insightful biographical essay from Ramsey Campbell, Britain’s premier horror author and a friend of Aickman. Cold Hand in Mine, re-published on 3 July, is the 1975 collection that made his name and includes the award-winning Pages From a Young Girl’s Journal. This cultish author’s admirers include Neil Gaiman; The League of Gentleman’s Mark Gatiss, Jeremy Dyson and Reece Shearsmith; and bibliophile Barry Humphries, who wrote that Aickman’s fiction “…captures the very texture of a bad dream which may start, as such dreams do, beguilingly; until the dreamer (and reader) feels the first presentiment of encroaching nightmare – and cannot wake.” Look out for further collections The Wine-Dark Sea (August) and The Unsettled Dust (September) as well as novels The Model and The Late Breakfasters this month in the Faber Finds series. A charming, flame-haired US singer and her daughter were here in the Riverside Bookshop the other day asking about the new Neil Gaiman (the book finally arrived today). We hope they come back, although we suspect the kindly Mr Gaiman will send them a copy seeing as the book’s acknowledgements include a thank you to his famous friend for lending him a house to write it in. And as the singer’s daughter is Gaiman’s goddaughter, she probably deserves the £250 deluxe version. The Ocean at the End of the Lane is not really for children though – in fact, it’s Gaiman’s first adult novel in eight years. Seeking solitude after a family funeral, the unnamed narrator wanders the Hempstock farm at the end of the country lane where he grew up. Sitting by the duck pond he remembers that once it was actually an ocean – and then he remembers everything. He’s transported back 40 years to an event that somehow unleashes an otherworldly, almost Lovecraftian evil into the Sussex countryside. The primal horror arrives in the form of a malevolent Mary Poppins, a housekeeper from another dimension who seems to know the boy’s every move. Fortunately, Lettie Hempstock and her family in the old farmhouse possess some ancient powers of their own. Lettie’s 11 but the boy thinks she may have been 11 for a very long time. Gaiman has surpassed himself with limpid, elegiac prose that conveys the secret world of a seven-year-old. There’s beautiful writing about the pleasures of childhood such as tucking into oozing honeycomb doused in cream from a chipped saucer or losing yourself in books (‘Why didn’t adults want to read about Narnia, about secret islands and smugglers and dangerous fairies?’). It also touches on adult themes of art, loss and (unreliable) memory and, like Lettie’s duck pond, it’s deeper and darker than the slim volume might suggest. We may have forgotten what it’s like to be seven years old in a world of capricious grown-ups but Neil Gaiman has remembered for us in this melancholy and moving adult fairy tale. It may be the best book he’s written.